This weekend (Sat 22 Sep) WNO is delighted to once more be a part of the North Wales International Music Festival, performing at the stunning cathedral in St Asaph. For the second year, WNO has created a Festival Chorus to perform alongside WNO soloists and NEW Sinfonia. North Wales International Music Festival has a long and successful history of having a Festival Chorus at the heart of the Festival. As part of Welsh National Opera’s North Wales Youth & Community programme, an ongoing and flourishing partnership has been established between NWIMF, WNO and Venue Cymru to create this second Festival Community Chorus. 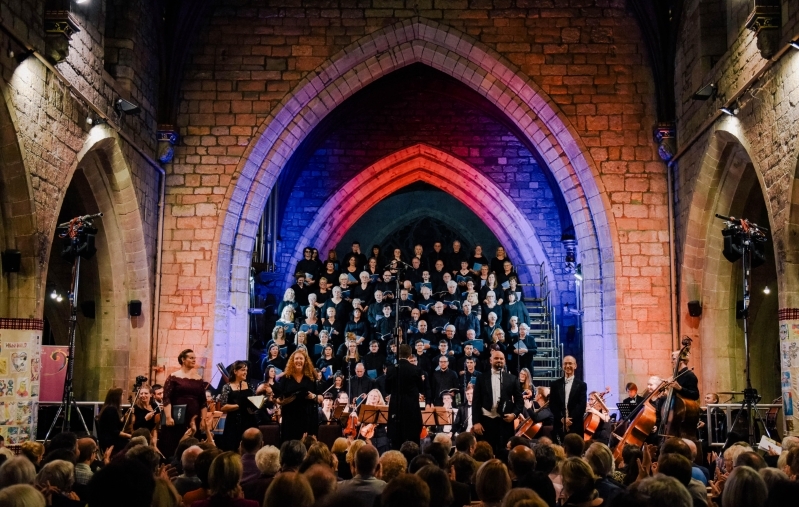 In 2017 they performed in A Magnificat Journey concert at North Wales International Music Festival alongside NEW Sinfonia, Côr Siambr Canolfan Gerdd William Mathias and WNO soloists conducted by Robert Guy. This year the programme comprises of Rebecca Dale’s Materna Requiem (world premiere), Mozart and Duruflé Requiem (excerpts), Spiegel im Spiegel (Arvo Pärt) and 4’33’ (John Cage). The Festival Chorus and NEW Sinfonia will be joined by soloists Katy Thomson, Rebecca Afonwy-Jones, Robert Lewis and Julian Close and Conductor Robert Guy. Rebecca Afonwy-Jones became an Associate Artist at Welsh National Opera for the 2013/2014 Season where highlights included Anna Kennedy Maria Stuarda with performances at Royal Opera House, Oman and Fourth Naked Virgin/Sick Woman Moses und Aron with performances at the Royal Opera House, Covent Garden. She has subsequently performed further roles with WNO including soloist in Judith Weir’s Sleeping Mat–Ballad (special commission), Flora La traviata, Beggar Woman Sweeney Todd, Lola Cavalleria rusticana and Suzuki Madam Butterfly with performances at Dubai Opera – and she is currently appearing in our Autumn tour of La traviata. Katy is thrilled to be returning to perform with WNO and NEW Sinfonia following her soprano soloist role in A Magnificat Journey in the 2017 NWIMF; Robert joined the 2013 cast of WNO Youth Opera's centenary production of Benjamin Britten's Paul Bunyan and returned in 2015 as a tenor member of an eight part ensemble in the Welsh opera Gair ar Gnawd by Pwyll ap Siôn; Julian returned to Welsh National Opera in 2017 to portray Don Juan in From the House of the Dead and for our productions of Der Rosenkavalier and Khovanshchina. Tickets for this concert have now sold out.